Today’s Objectives…. 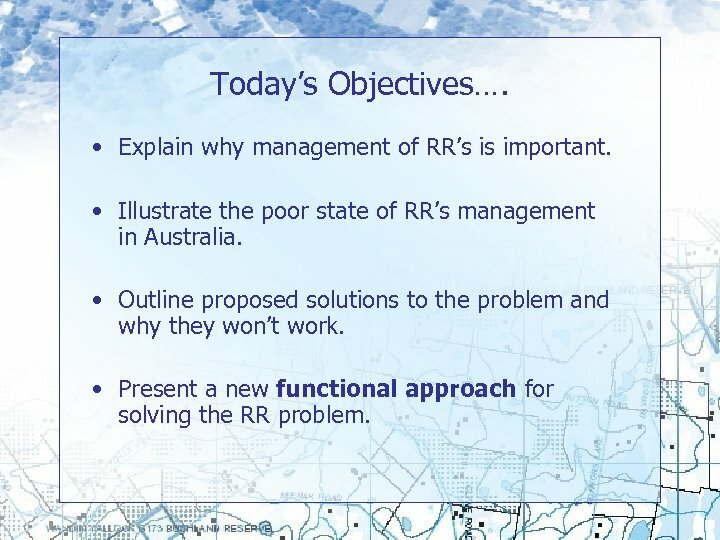 • Explain why management of RR’s is important. 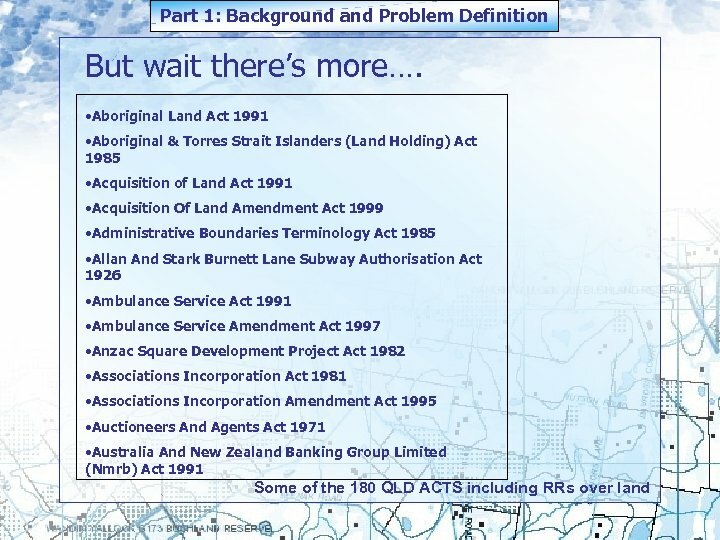 • Illustrate the poor state of RR’s management in Australia. • Outline proposed solutions to the problem and why they won’t work. • Present a new functional approach for solving the RR problem. 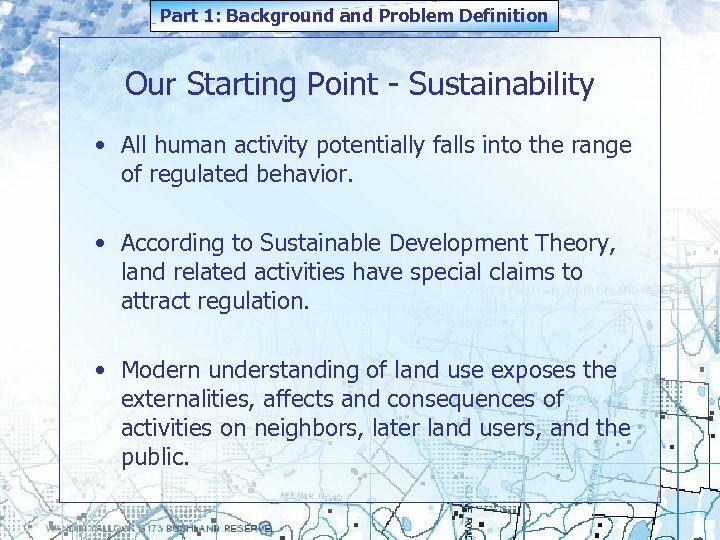 Part 1: Background and Problem Definition Our Starting Point - Sustainability • All human activity potentially falls into the range of regulated behavior. 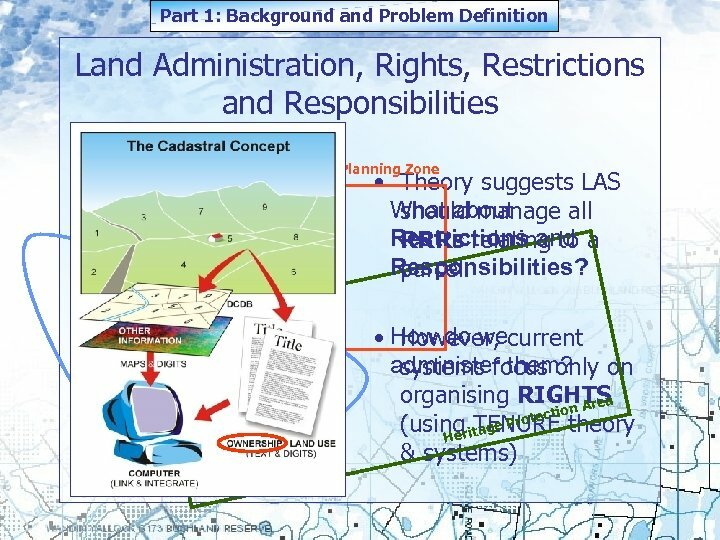 • According to Sustainable Development Theory, land related activities have special claims to attract regulation. • Modern understanding of land use exposes the externalities, affects and consequences of activities on neighbors, later land users, and the public. Is there a ‘quick fix’…? ? 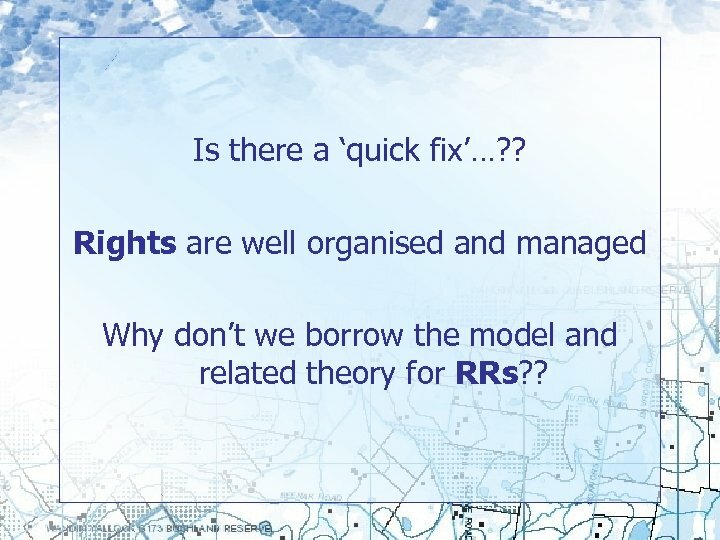 Rights are well organised and managed Why don’t we borrow the model and related theory for RRs? ? 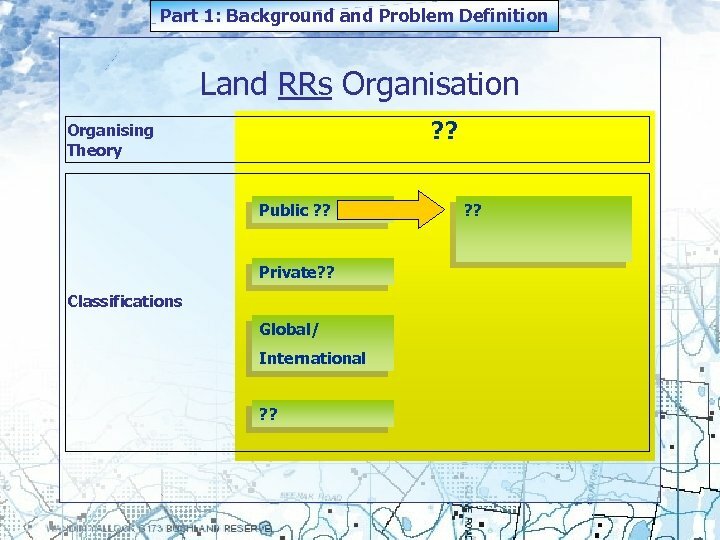 Part 1: Background and Problem Definition Land RRs Organisation ? ? Organising Theory Public ? ? Private? ? 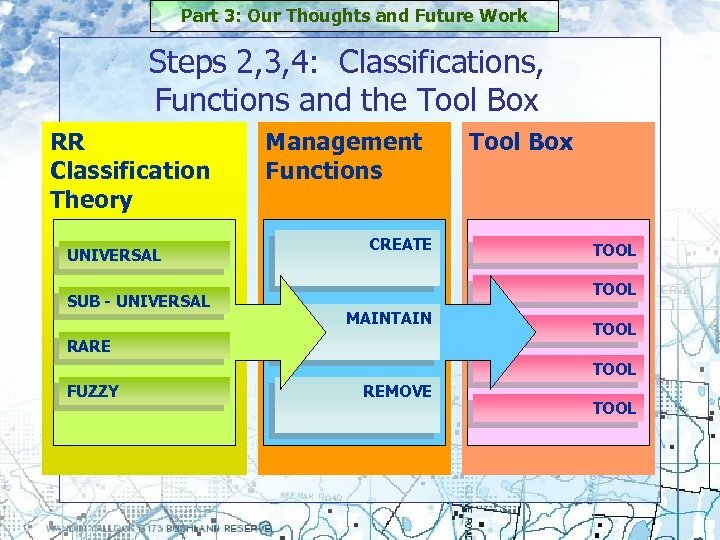 Classifications Global/ International ? ? 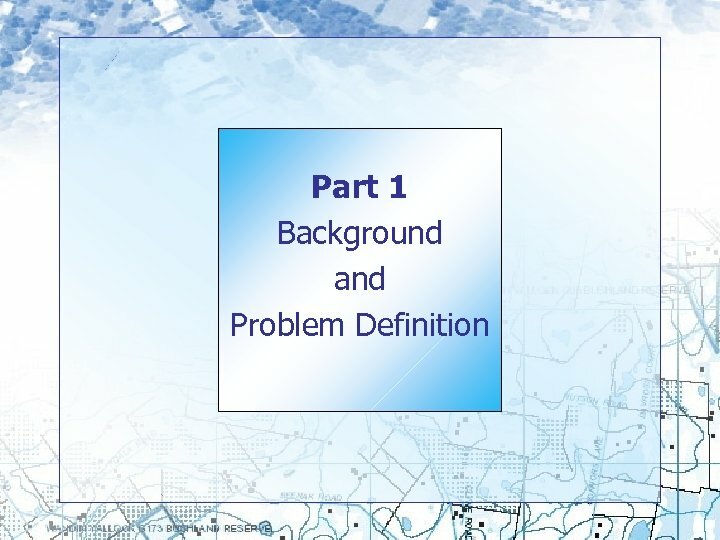 Part 1: Background and Problem Definition What does having no model result in? 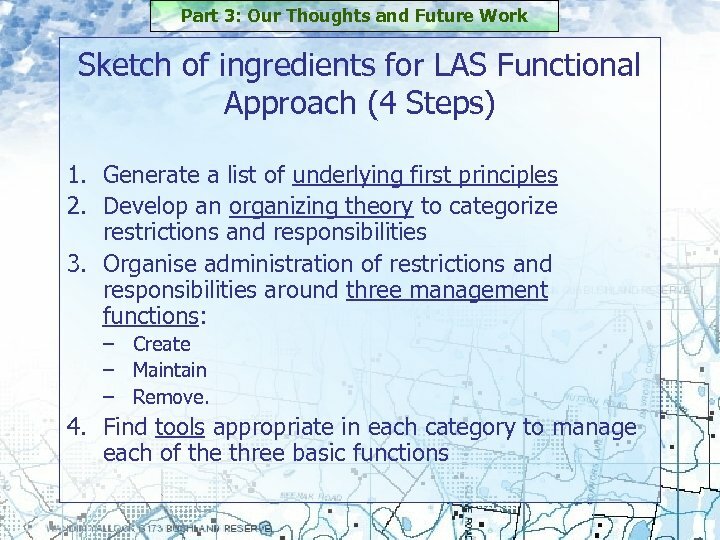 Conversations about how to approach restrictions and responsibilities are impeded: – No standard model for organization of RRs exists. – No solutions are emerging. – Ad hoc responses are evident. – Confusion between policy clashes and administrative failures. 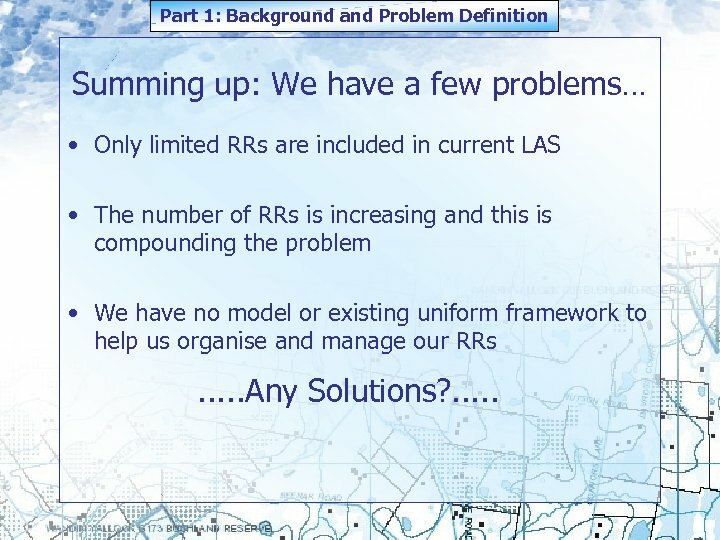 Part 1: Background and Problem Definition Summing up: We have a few problems… • Only limited RRs are included in current LAS • The number of RRs is increasing and this is compounding the problem • We have no model or existing uniform framework to help us organise and manage our RRs . . . Any Solutions? . . .
Part 2: Current Ideas and Proposals 1. The “Expanded Register” Approach Victoria has 2 strategies 1. 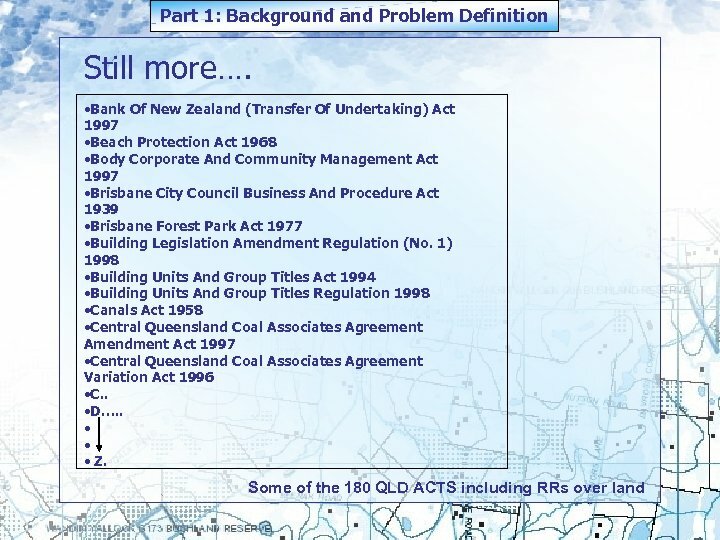 Use Title Certificate – Planning agreements (s 173 planning legislation) are ON TITLE. 2. 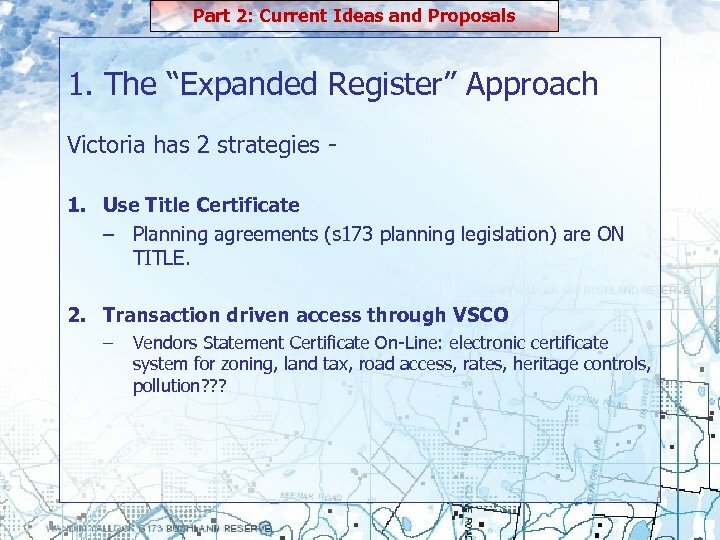 Transaction driven access through VSCO – Vendors Statement Certificate On-Line: electronic certificate system for zoning, land tax, road access, rates, heritage controls, pollution? ? ? 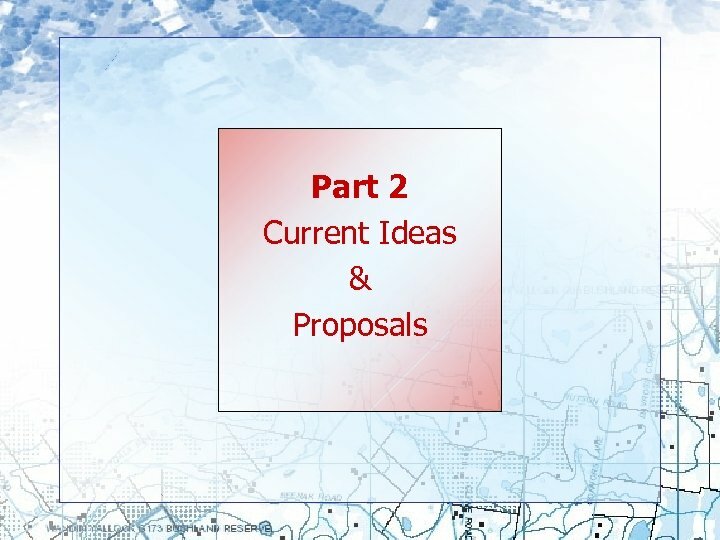 Part 2: Current Ideas and Proposals 2. The “All In” Approach Example: . 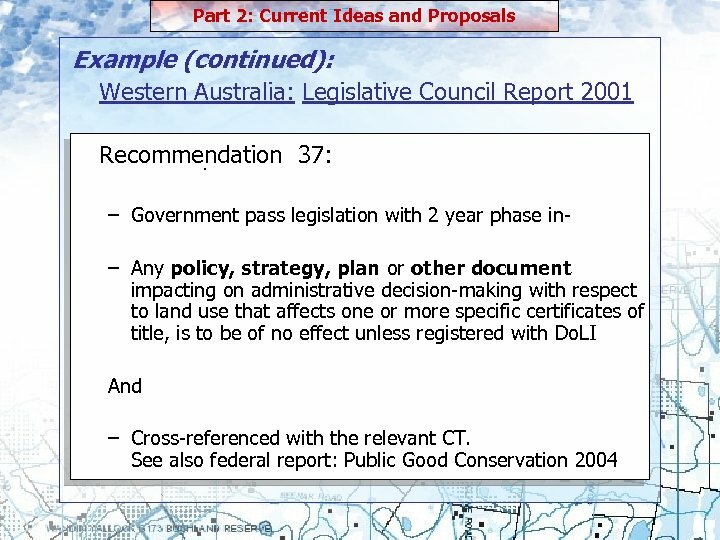 Western Australia: Legislative Council Report 2001 Recommendations 35 and 36: – In the short term the Do. 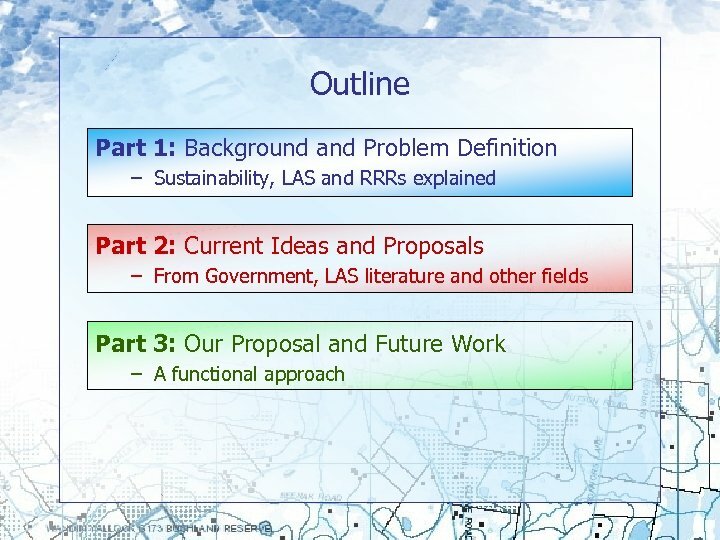 LI continue to implement its aim of establishing itself as a ‘one stop shop’ database of all interests affecting land as an urgent priority. – For the long term the Do. 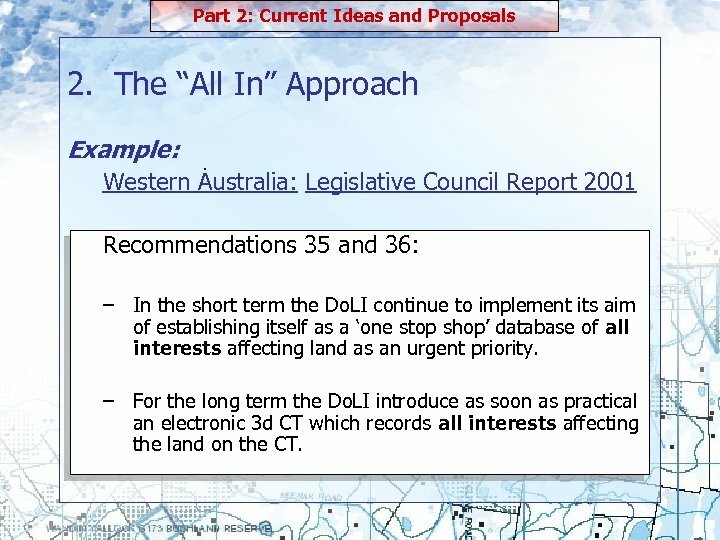 LI introduce as soon as practical an electronic 3 d CT which records all interests affecting the land on the CT.
Part 2: Current Ideas and Proposals 5. 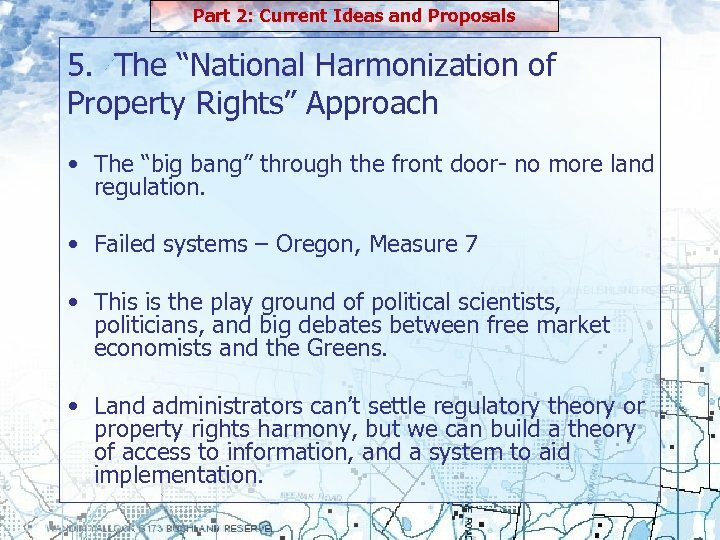 The “National Harmonization of Property Rights” Approach • The “big bang” through the front door- no more land regulation. • Failed systems – Oregon, Measure 7 • This is the play ground of political scientists, politicians, and big debates between free market economists and the Greens. 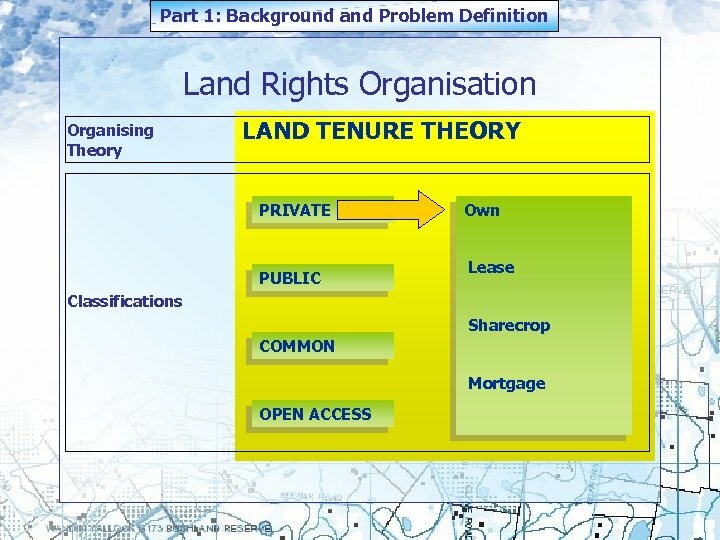 • Land administrators can’t settle regulatory theory or property rights harmony, but we can build a theory of access to information, and a system to aid implementation. Part 2: Current Ideas and Proposals 6. 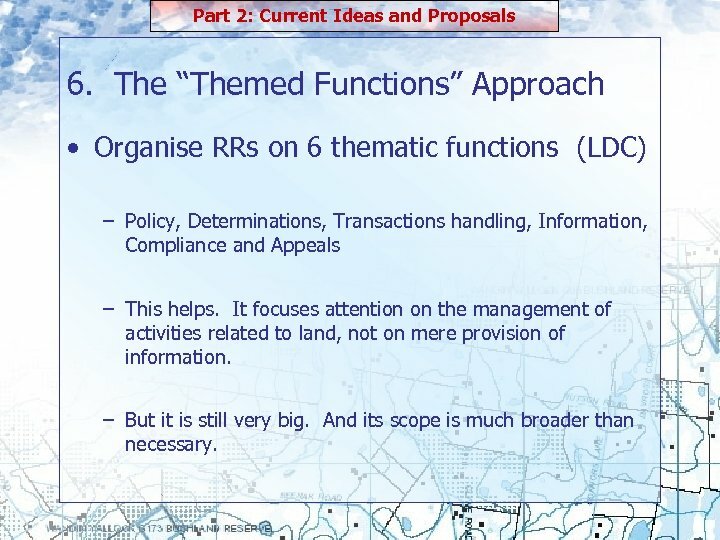 The “Themed Functions” Approach • Organise RRs on 6 thematic functions (LDC) – Policy, Determinations, Transactions handling, Information, Compliance and Appeals – This helps. 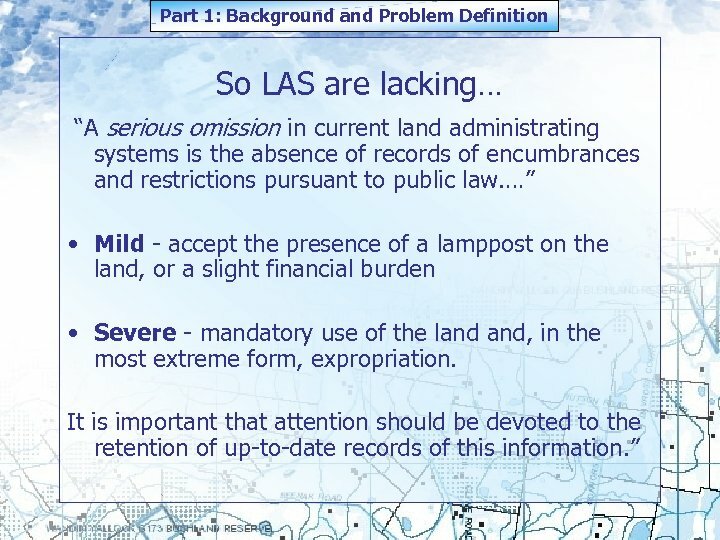 It focuses attention on the management of activities related to land, not on mere provision of information. – But it is still very big. And its scope is much broader than necessary. 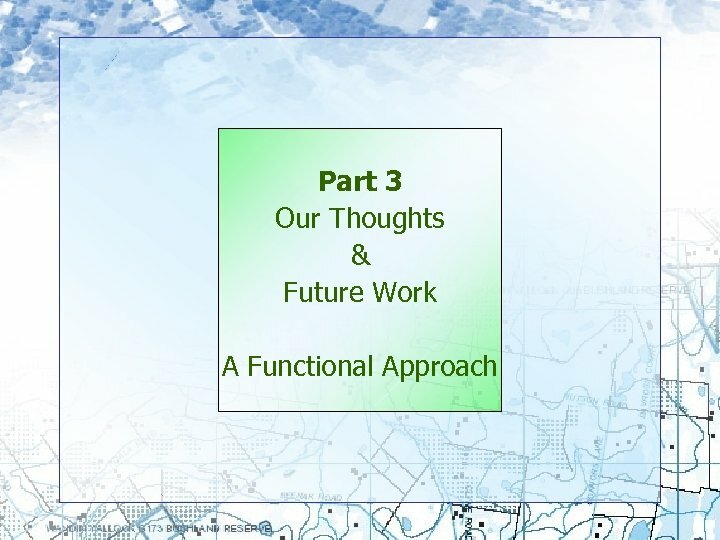 Part 3: Our Thoughts and Future Work Step 1: Underlying First Principals to date 1. Treat government and private restrictions similarly. 2. 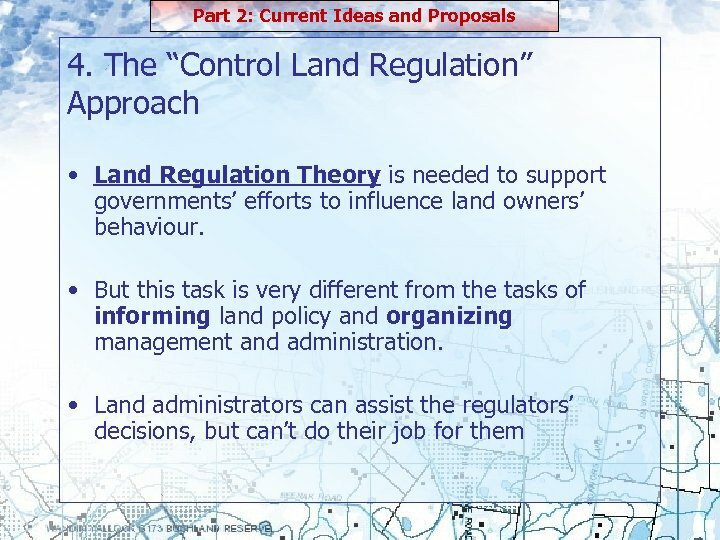 Treat land management the same as other government responsibilities. 3. Make core restriction information available FREE. 4. Focus on RRs that affect later owners. 5. 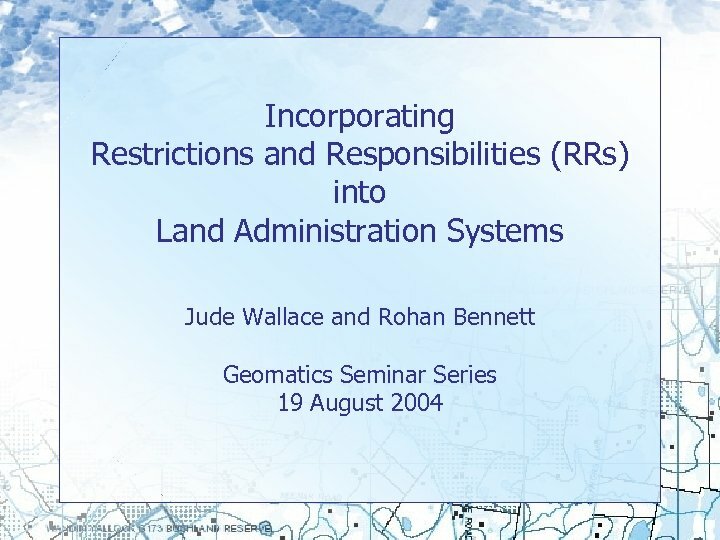 Use a whole of government, not whole of land approach. 6. Share information to off-set costs of collection and maintenance. The principle of collect once and use many times should be mercilessly applied. 7. 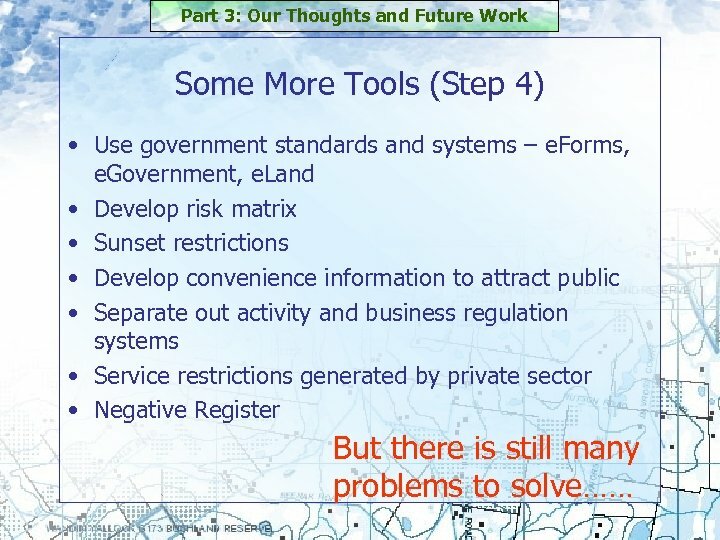 Use rights based management tools where possible to manage restrictions. 8. ? ? 9. ? ? 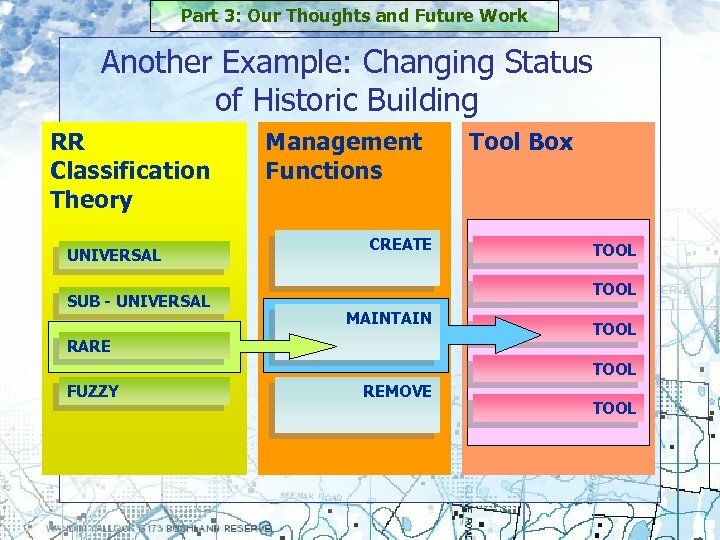 Part 3: Our Thoughts and Future Work Government activities are not neat and tidy • Uncertainties and relativities must be managed This is not a problem. Science is happy with uncertainty. 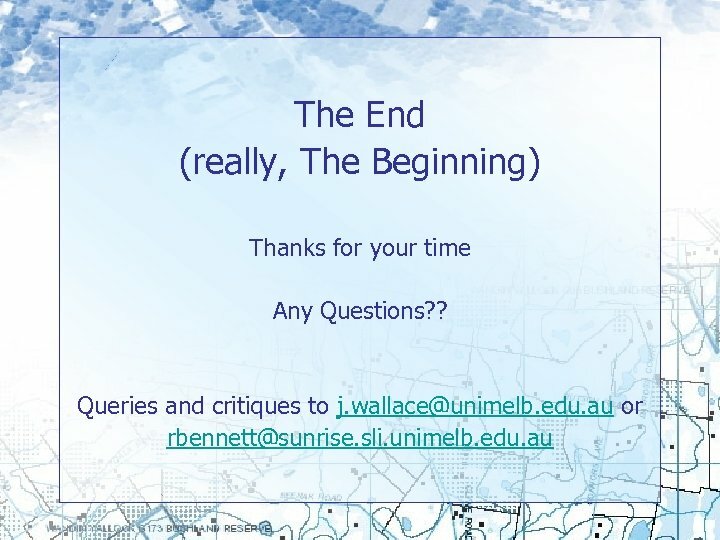 Spatial science is no different. – Relativity – Einstein. Certainty is the relationship between objects and the relationship is relative. 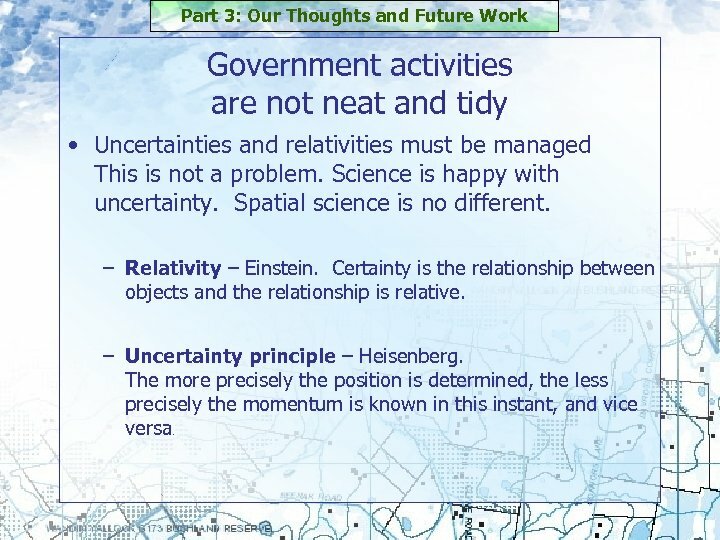 – Uncertainty principle – Heisenberg. The more precisely the position is determined, the less precisely the momentum is known in this instant, and vice versa. 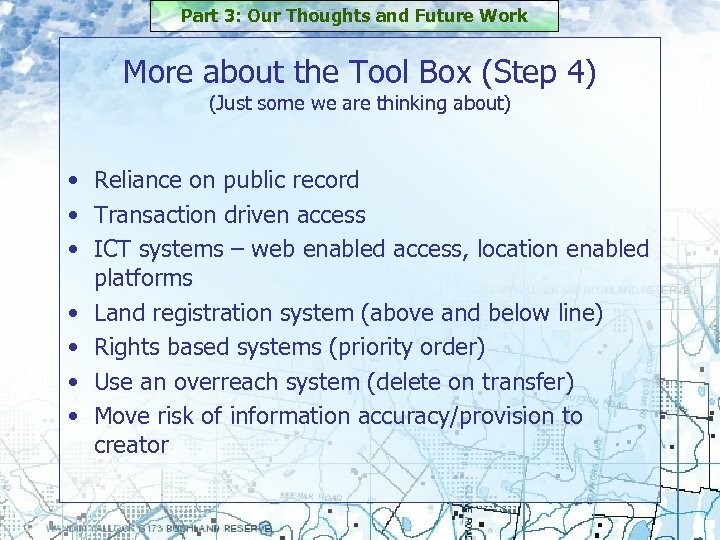 Part 3: Our Thoughts and Future Work Potential Trouble Cases • Three kinds – Multi-faceted information, only part of which is land information. – Regulatory information, often “fuzzy”. – Responsibilities and restrictions are taking on more international flavour through regional arrangements, sharing, treaties and conventions. 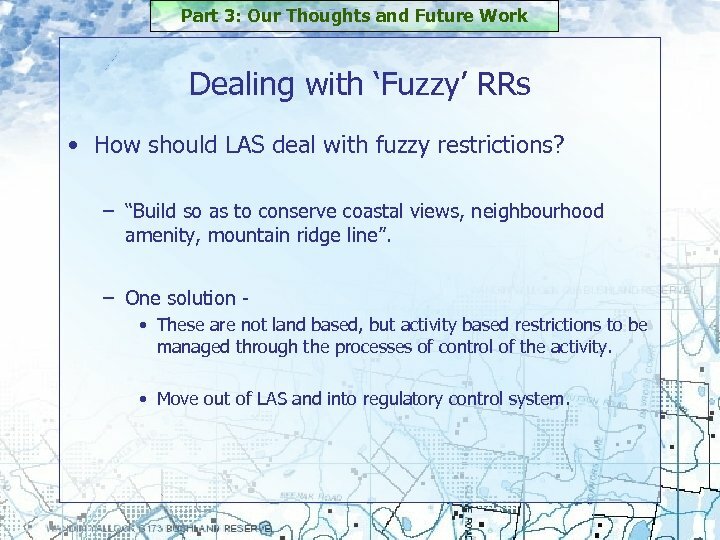 Part 3: Our Thoughts and Future Work Dealing with ‘Fuzzy’ RRs • How should LAS deal with fuzzy restrictions? – “Build so as to conserve coastal views, neighbourhood amenity, mountain ridge line”. – One solution • These are not land based, but activity based restrictions to be managed through the processes of control of the activity. • Move out of LAS and into regulatory control system. 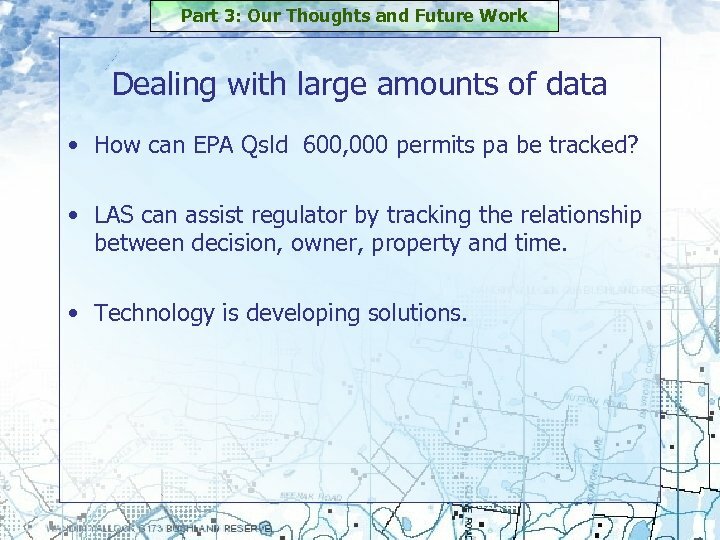 Part 3: Our Thoughts and Future Work Dealing with large amounts of data • How can EPA Qsld 600, 000 permits pa be tracked? 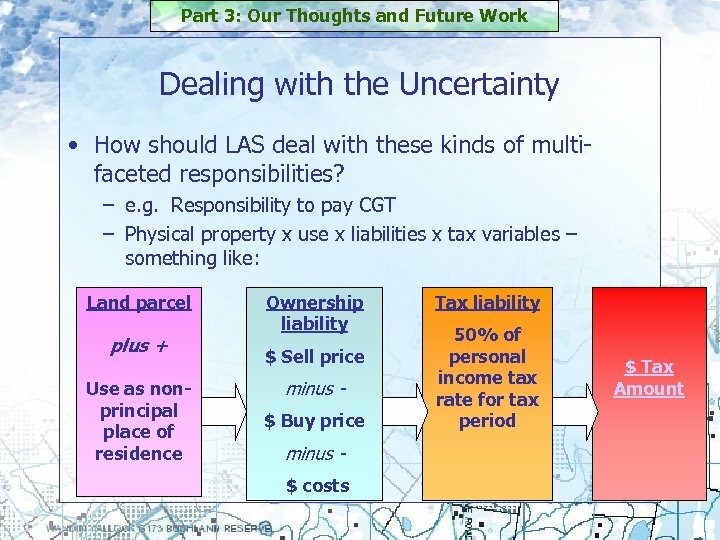 • LAS can assist regulator by tracking the relationship between decision, owner, property and time. 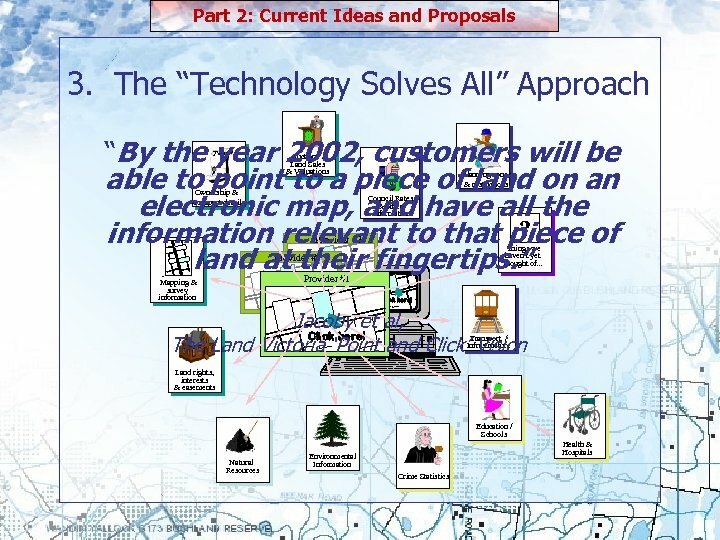 • Technology is developing solutions.